So, you’re playing canasta with Frankie and da boyz and, being the good host, you notice it’s about time for another round of brewskis. You leave the canasta table and shuffle over to your spiffy GE fridge. When you open the beer compartment door (women usually call it the “fresh food” door; yeah, as if!) the flashing lights inside give you a flashback to your magic mushrooms days in college when you would stand in front of the fridge for hours with the door open, contemplating the meaning of life as revealed in that mayonnaise jar with green fuzz growing in it. No wonder you flunked out of college, you realize in an epiphany moment. But this time, you’re wondering what’s wrong with your refrigerator lights. So you surf over to Fixitnow.com Samurai Appliance Repair Man and find out that you need to replace the LED board located in the muthaboard compartment in the back of your refrigerator. 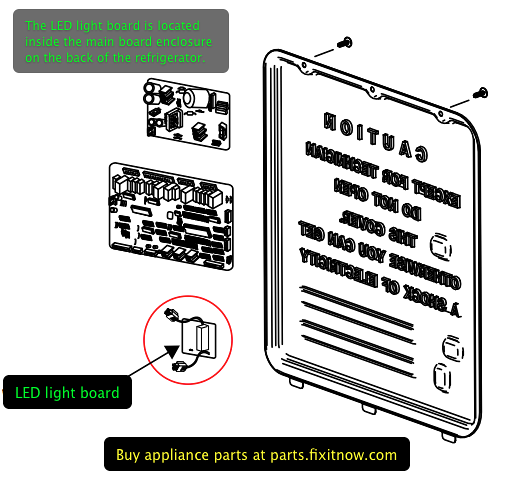 In addition to finding out what the problem is and where the LED board is located, you squeal with delight when you learn that you can buy the part right here with a 365-day, no-hassle return policy! Still confoosed, Grasshoppah? Come see us in the Samurai School of Appliantology and we’ll confoose you some mo’! This entry was posted in Refrigerator Repair on February 13, 2011 by Samurai Appliance Repair Man.